Sunday 11th November 2018 say the 100th anniversary of the end of World War 1. As part of the events to mark this anniversary, on 32 beaches across the UK, giant sand portraits were created of some of the men & women who lost their lives during the war. The portraits were created by volunteers at low tide, and as the tide came in, they were gradually erased. 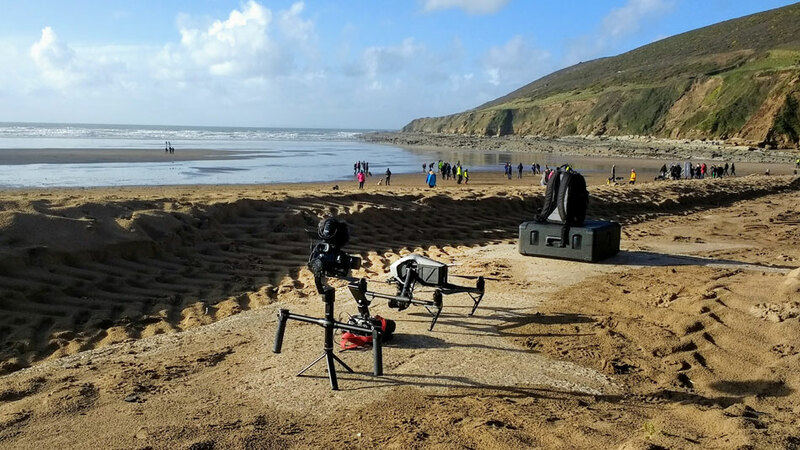 We were contacted by Adam from Aerial Media Services who had been asked to film the Saunton Beach portrait with his drone. However Adam also needed a gimbal operator to capture some of the other events on the beach, so we loaned him Stu for the day. Renowned director Danny Boyle has been working on the project, titled 'Pages of the Sea', and will be creating a short film about the day. On the day, drone operators and film crews across the UK captured the live events and uploaded the footage to be edited into an 'as live' Facebook Live stream. A documentary will also be produced in the future. Stu used Adams own gimbal and camera, but we had our Ronin-S on location with a Sony a7s as a back-up (thankfully it wasn't needed). We also provided a Macbook pro to use for uploading the footage in our media room which was kindly provided by Saunton Sands Hotel. Stu captured a range of beach events and also took control of ensuring that the footage was uploaded successfully. Unfortunately the by the time the tide washed away the portrait, it was far too dark to film with the drone (an issue which had been foreseen by the organisers and was sadly out of our control) but Stu did manage to get some footage of it at ground level using a light. All footage was transferred to Adams HDD and he will post the Hi-res clips to Danny Boyles media company for the final edits.